City planning chiefs have unanimously backed proposals to replace Birmingham&apos;s Axis building. London and Continental Railways is behind the scheme to demolish the ten-storey block next to the Mailbox and build a brand new, nine-storey office building called One Axis Square along with public realm. Birmingham City Council&apos;s planning committee praised the plans, which will also neighbour the new Arena Central development, despite the designs receiving a negative response from our readers when they were unveiled in December. Coun Barry Henley (Lab Brandwood) told the committee: "I welcome this development - it&apos;s a very attractive new building and a clever way to utilise the area the Axis now stands on more effectively in a higher density way while producing some good, new public open space. "Overall, the design and the initiative are to be complimented." Coun Peter Douglas Osborn (Con Weoley) added: "As a modernist building, I think it leaves a bit to be desired and this particular improvement gives it more character. "It&apos;s going to add a bit of character to the area and I think we should welcome it." The new office building will be constructed first after which the 1970s Axis complex will be knocked down to allow incumbent tenants to stay in situ, with some expected to move into the new facility. This will contain 212,000 q ft of office space and 2,300 sq ft of ground floor retail units along with basement car and motorcycle parking, public realm and landscaping, changing facilities and secure space for 200 bikes. New vehicular access to the site from Holliday Street will also be installed as part of the redevelopment. 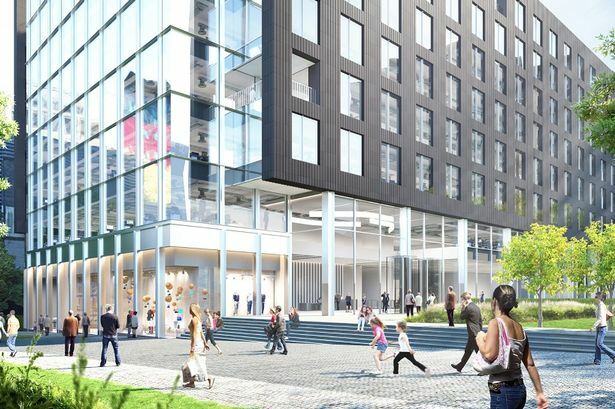 It is the first phase of a larger redevelopment of the site which will also include a new public square and further office and commercial space. Nick Clough, development manager with London and Continental Railways, said: "We are really looking forward to delivering the Axis Square development for Birmingham, a project of the highest quality in a prime location. "Consultation feedback has led to design changes, wider scheme improvements and the provision of funds for enhancing Navigation Street and the surrounding landscape. "This approval means we can move forward and continue to work on future planning consents, delivering a range of benefits for the evolving city centre."